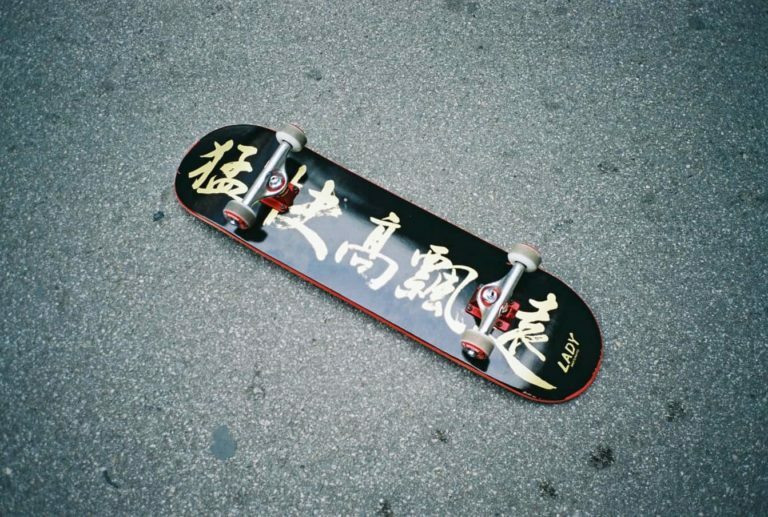 Learning how to Kickflip is like a right of passage for any beginner skater. They are the trick that we all want to learn when we start skating, but they are very difficult. Kickflips take time to learn and even longer to master, but they are so worth it when you roll away from a nice one. Once mastered, they will become the trick that you do every time you skate and be your best friend when it comes to gaps, stairs, hips, euro-gaps and everything else. Here’s our breakdown of how to do a Kickflip. Remember, lovely looking and feeling kickflips come with time. The more time you put into your kickflips, the better they become. What tricks do you need to learn before a Kickflip? Ollie: the must know trick for any flip trick. If you can’t ollie, you can’t flip your board, but if you can ollie you can kickflip. 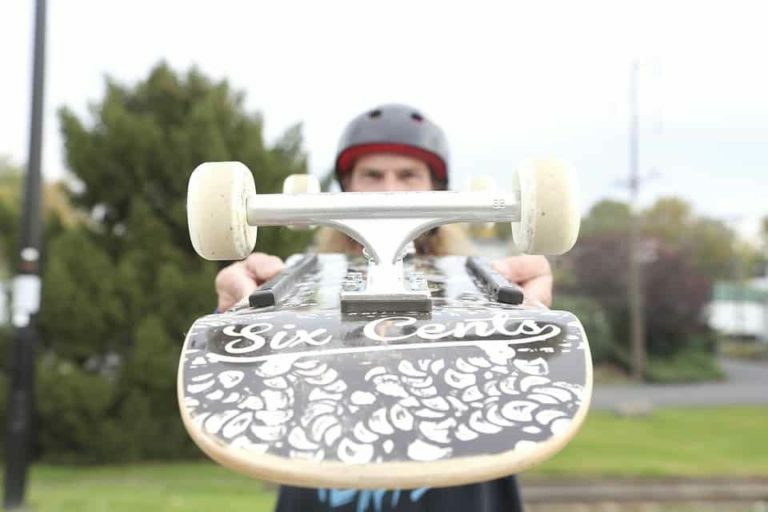 Of course, having stability and control of your board helps a lot too, and so you may want to learn pop shuv-its and 180s and things before flips, but they aren’t needed for kickflips. They are, however, needed for flip variations, which we will get to in just a little bit. Here are our tips for kickflips. These will help you land kickflips a little faster, but only you can put the work in that’s needed to get a beautiful looking kickflip. Everyone’s foot placement for kickflips varies slightly. Some people prefer to have their flicking foot all the way on their board while others like having it hanging off slightly. We like to have our foot in the middle of the board, just behind the front bolts. This seems to be the universal position for kickflips, but if you don’t get on well with this position, try putting your foot further on the board or closer to the edge. The position of your back foot is something that most people agree on. This should be in the middle of the tail right at the back of it. This needs to be as central on your tail as possible without any overhang on either side or the back at all. 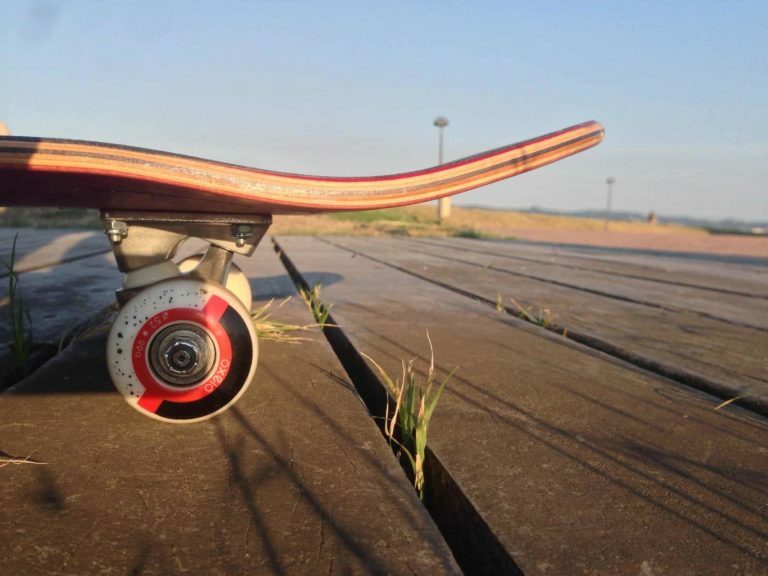 If you have any overhang on your back foot, your board will start to spin when you pop; this means that it is going to spin and flip and that isn’t a kickflip. It is worth practicing your foot position for kickflips a lot. Knowing where you like your foot for flips will help massively when it comes to flicking them. Your back foot position is very similar to an ollie, and that is all you are going to do with your back foot. Just pop an ollie with your back foot. Your front foot does all the work with a flip. As I’m sure you know, to ollie you slide your front foot up the board towards the nose. This levels out the board in the air. However, with a flip, you want to slide your front foot up the board, but then kick it sideways when it reaches the pocket of concave on your nose. This keeps the board level while you are in the air, but also flips the board. This flick needs to be quick. It needs to happen a fraction of a second after you pop your ollie. The quicker you flick the flip, the more time it has to complete the rotation. So now you’re in the air doing a kickflip, what happens? Well, you don’t really need to do too much in the air. You see, when you flick the board, the board will come away from your back foot, and your front foot will stay away from the flipping board too. So your position in the air is already taken care for you thanks to the way you’ve popped and flipped the board. Now all you have to do is catch and land the kickflip. Catching the board for a kickflip is all done with the back foot. Your back foot is hovering over the board as it flips so when the kickflip reaches your foot and touches it, this stops the board flipping. This is known as “catching the board” now all you have to do is get your front foot back on. This can be scary and feel strange at first. But trust that you have completed the flip and that your board is ready for your front foot. Of course, sometimes, if you flip too hard or not hard enough, your back foot may catch the board before it has flipped fully or afterward. This means that you may land primo, but you can stop yourself from doing this if you just open your legs sideways. Let the board carry on flipping and open your legs. This will mean that the board is flipping between your legs, but it shouldn’t hit anything valuable! If you have caught the flip with your back foot and the front foot has come back to meet it in the air, landing it is as simple as letting gravity do its work. As long as your weight is over the board, you’ll roll away smooth. However, if you don’t catch the board in the air, you can still land a kickflip. This means that you’ll be landing the flip as the board meets the ground which is a little more dangerous than catching it. The reason it’s a little more dangerous is that your balance is always central when this happens. This means that you can get flung off the board backward or forwards. However, if you spot the board while you are in the air and get ready to land on it, you should be fine. Just look for the board completing the flip and when it has, put your feet back on the board. Of course, just like any trick in skateboarding, you will get better at kickflips as you progress. If you aren’t catching your flips at first, don’t worry, just be happy that you can flip and keep practicing. You’ll be catching them in no time! If you still need a bit of extra help perfecting your kickflips, then check out this fantastic video tutorial. Now you’ve mastered the kickflip, you might be wondering what’s next? The natural progression from learning a kickflip is to learn how to Varial Flip. You can also learn kickflip variations, like varial flips. While you are here, let’s learn how to do varial flips too, shall we? Varial flips used to get a bad rep back in the day. For years they were the 360 flip’s ugly cousin. Thankfully, nowadays a lot of you younger skaters are bringing them back and are doing them some serious justice! Now, varial flips have some beautiful style and can look just as good as 360 flips! Although we can not teach the style factor of varial flips, ours are still extremely ugly! We can teach you how to varial flip. You’ll have to ask someone with nice varial flips to teach you their ways, but it will be easier to learn their ways if you know the basics of a varial flip. What tricks do you need to learn before a Varial Flip? Let’s break down the varial flip so that we can start to learn it. The foot placement for a varial flip is a combination of your foot placement for a flip and a pop shuv. Your back foot should be in the position you’d put it for a pop shuv, and your front foot should be in your kickflip position but slightly closer to the edge of your board. We put our front foot closer to the edge of our board and at a steeper angle. Please see the picture for a better idea of this. Your foot position may vary to ours so try a few positions until you find one that works for you. Popping and flicking a varial flip isn’t difficult. It is much the same as popping a kickflip. With a kickflip, your back foot does the ollie, and your front foot takes care of the flip. Well, with a varial flip, your front foot does all the flicking for the flip, and your back foot does the pop shuv-it. This can take a while to master, but just remember, you are just doing two tricks that you can already do but at the same time. You are already used to landing both; now you just need to land both at the same time! Keep an eye on your board as it flips and spins. Your feet will naturally keep clear of the board in the air and allow it to rotate and spin fully. When it is starting to come round and complete the flip and the shuv, put your feet back on the board. That is about it, that’s a varial flip. They aren’t too difficult to learn as long as you are comfortable with backside pop shuv-its and kickflips. They are tricky to master though so don’t expect to have beautiful looking varial flips from the moment you learn them! Still struggling with the Varial Flip? Don’t worry, if you need a few more tips this video tutorial breaks down the trick step by step. That’s it, now you know how to kickflip & varial flip, go and give them a try! The kickflip is a favorite trick of ours, a simple kickflip can be included in so many other tricks. You can flip in and out of grinds and slides, flip in and out of manuals and so much more. 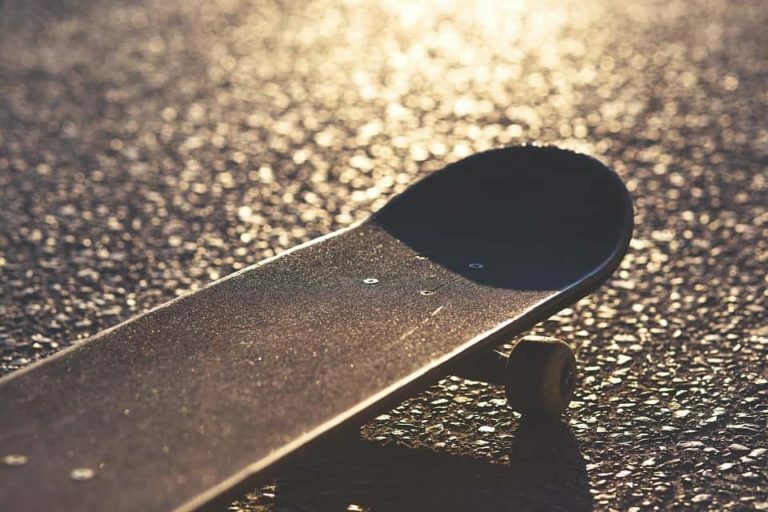 Once you’ve learned both of these, we’re sure you’ll want to learn some more advanced tricks, such as the varial flips older, cooler brother, 360 flips. Well, you’re in luck as we have a trick tip on here all about 360 flips so make sure you check that out when you think you are ready to step up to the best trick in the world of skateboarding!